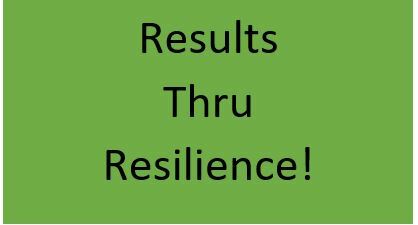 New Result thru Resilience Program Pilot! Who wants to complete a summer project by the end of August? It can seem like so much thinking happens with thoughts of undone projects hang over our heads. We try to act and nothing happens. When we don’t achieve the results we want, inside we start to beat ourselves up and the cycle continues. What if there was a way to break the cycle and see Results Faster? For over two years I wanted to be part of a program called Project Glasswing by international Clarity Coach Jamie. My reasons for not being able to take the course were ability money and time. Let me share with you how I created the results I wanted in my life using the power of resilience. In order to take this program in record time. Three months ago, I made the decision to finally take Jamie Smarts Project Glasswing? I thought I did not have the money time or ability to do such a program. Now fast forward to the end of July I am more than half way through the program. Ability part check! Show me the Money? By February of 2017 I had entered a competition for a Department Head at the Retail Store where I was employed. It came down to myself and one other person. I did not get the position. That was Ok. The weird part of this story is that less than one week later another part time employee who had less than 6 months of experience got promoted to a full-time sales position. Everyone including myself were surprised at managements decision. I had people come up to me and say they could not believe I did not get offered such a position after 4 years of service. On the outside, I looked OK with everything. Inside I was furious and angry and questioning everything about myself. My self esteem was low. In less than 24 hours I decided to do something about it. I took up a personal challenge to leave and find new employment. Now it is early March 2017. I gave myself less than 60 days to find a full-time position and sign up for Project Glasswing. Both happened in the allotted time frame. I realized that my financial and career destiny were completely in my hands. Not someone else. I created the time space and finances to look for a full-time job. During that 60 day challenge I did in deed join Project Glasswing. Regardless of my state of mind I leaned into my resilience and got creative to finally get a full-time job. That was May 3rd, 2017. Fast forward to July 14, 2017. I am promptly let go from my newest job with out reason. It is allowed where I live. I decided to create some results fast. I leaned into my resilience again and have created two potential employment offers in less than two weeks. Both of which will start the first week of August. I got out of my own way and created the results I wanted. The question is which one to take? Why do I tell you these things? Because I saw that once you factor in resilience results go together. When you stop listening to all those excuses and reasons about why you Can’t and start saying Can and Will. The Doing comes naturally. Going from zero opportunities to two options is a nice feeling. It is also empowering to see what really holds us back are only thoughts in the moment. Too often people decide to start and finish a project. Only to suffer from shinny object syndrome. They marry themselves to rituals, habits and routines. Relying on them means doing things the hard way. Also, if for some reason they fall away we go back to square one. Feeling like what is the use? When we are supported to create change from the inside out, we begin to gain traction. Suddenly the unmoveable roadblock suddenly looks like a pebble. Why because we start to gain the clarity and understanding necessary to release our inner power which starts to work in our favor, rather than fighting against ourselves. We begin to stand in our space where true inner power originates. We begin moving past what looks like an unmoveable roadblock. Since standing in my own power over the last 7 months people have commented on the changes that they have witnessed within myself. Even within the last week, friends and family have noticed a shift and asked What are you on? The Resilience comes from taking the next step. What ever that looks like to you in the moment! It will be different for each person. And the Results each person experiences will be different as well. When you start to see that the only thing which stands between you what you want is thought. Suddenly the world begins to look a little less scary. Titanic problems melt in size. You start to see what is possible for you. And how quickly projects can be accomplished in much shorter time frames. I am looking for 10 committed people who want to get that summer project finished. How to Stop letting worry and other negative feelings get in your way. How to see that you have everything inside of you to get projects completed on time. The course is 4 weeks and all online beginning August 4. Upon enrolling you will receive an email to set a date for a complimentary coaching session with myself. Plus, all the other information related to the group.